For a third time, the Ryukyu Golden Kings proved to Japan it’s a basketball powerhouse, rolling over the Akita Northern Happinets to win the Basketball Japan League Championship for a third time. The Sunday evening championship at Tokyo’s Ariake Colosseum was billed as the perfect match up between the East and West Conference champions, and it started out that way, with a 24-24 tie at the end of the first quarter. From there, it was all Golden Kings as the Western Conference champions bulldozed their way past the Northern Happinets en route to a 103-89 victory. The Okinawa win was its third championship, tying the Osaka Evessa, which also had three wins in its heyday in 2006, 2007 and 2008. Golden Kings Head Coach Tsutomu Isa wasn’t so sure it was an easy contest, saying “we knew we had to hit hard on the offense. I was scared and wasn’t able to breathe until the end.” He need not have worried; his squad performed admirably, particularly in the third quarter when the Kings reeled off a 20 points spree while holding the Happinets to only four. Ryuichi Kishimoto rejoices after being elected MVP. Ryuichi Kishimoto, who picked up the Most Valuable Player honors, was hot, to say the least, scoring a game-high 34 points, also picking up five rebounds. 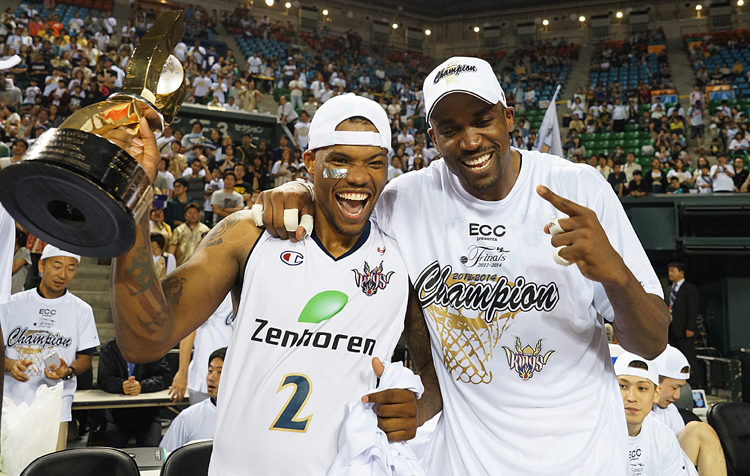 The hot shooting by the 24-year-old sparkplug came only a day after he was held scoreless in the Western Conference Championship Game against the Kyoto Hannaryz. The other Ryukyu guard, Draelon Burns, scored 21 points, while Narito Namizato, Kibwe Trim and Anthony McHenry each contributed 14. 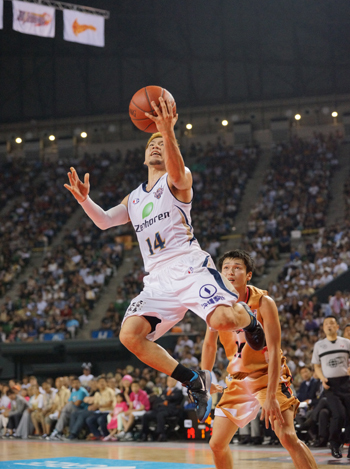 Ryuichi Kishimoto scored 34 points in a stellar performance on Sunday. In the Basketball Japan League Consolation Game, the Toyama Grouses powered past the Kyoto Hannaryz 84-62. Playing in their third Final Four in a row, the Hannaryz couldn’t get any traction, trailing by as much as 26 points in the final quarter. Toyama doubled the scoring of the Hannaryz in the first half to lead 42-21, then kept the spread to 59-42 at the end of the third quarter. Toyama’s victory was its first conference championship and also its first shot at the Final Four. They’d finished the regular season 45-11, while the Hannaryz finished second in the Western Conference, behind the Golden Kings, with a 36-21 season record.